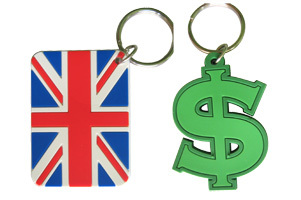 Rubber keychains are made of flexible soft PVC which is 100% water proof and can’t be broken or scratched. 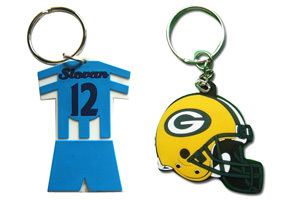 With a colorful and vivid logo, they are perfect for decorating keys, zippers, or anything you can think of! What are the Benefits of Rubber Keychains? Keys are an important part of all of our lives. We use them to open the doors to our homes, cars, safety deposit boxes, and more. However, physical keys themselves are very small, and if we’re not careful, they can be lost and very difficult—if not impossible—to find again. Rubber keychains are a simple and smart solution. The pendant on a keychain attracts our attention and helps us keep track of where we put our keys. 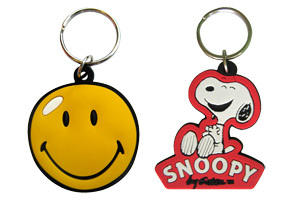 A rubber keychain help make you more efficient and able to avoid unnecessary daily troubles. There are two options available for the front of your rubber keychain: a flat 2D surface, or a bulging 3D surface (see the picture below for examples). Both logos are injected wholly with rubber. Tip: We usually advise customers to use a 2D design as it is the less expensive option. Moreover, not all logos are suitable for a 3D design. Option 1: The back can be left blank without any text or logos. This is the lowest priced option. Option 2: Text can be printed on the back such as your company’s contact information, phone number, website, etc. Option 3: The same rubber injection used on the front can be used on the back. This is the most expensive of the three, but it produces the best look and feel. Tip: Most customers choose Option 2, which offers a great advertising effect at an affordable price. Due to this, we generally advise customers to take this option. 1. Confirm the basic shape, layout, and size of your desired product. 2. Choose the logo you would like used. Popular choices include trademarks, brand images, slogans, text messages, phone numbers, and website addresses. 3. Pick up to 7 solid colors for your custom design (fewer colors means lower production costs). While you can choose more than 7, there is rarely any need and it only serves to make for a more expensive order. Gradient colors are not available. 4. Submit your artwork or design in a vector file (such as Adobe Illustrator .AI or Corel Draw .CDR) and let us know how many rubber keychains you would like to purchase. 5. We’ll make any design changes necessary and will send you the final artwork for your approval, as well as review order information. Once approved, the production process will begin. Please let us know if you would like a pre-production sample!